I was really hoping I would have the new site set up by now, but I just haven’t found the right template or header design yet. I do like the three column design though. Anyway, since I’m still here, I thought I would post the girls’ new obsession, their own maki sushi! If you’d like to try your hand at rolling your own sushi, the California Roll is one of the easiest to make and also pleasing to most palates. For one, it doesn’t have any raw fish for those who are still squemish about eating raw fish. My girls don’t have that problem though, they love sashimi! I just haven’t found any sashimi grade fish around our area. So California rolls and Shrimp sushi it is. SUSHI RICE: start by cooking your desired amount of rice for sushi . While the rice is cooking, mix in a small bowl: rice vinegar, salt and caster (fine) sugar. If you noticed that I didn’t give any proportions, that’s because the amount of the seasonings will depend on how much rice you are using. As a starting point, for two cups of cooked rice I will probably use about three tablespoons of vinegar, a pinch of salt and maybe a half a teaspoon of sugar. When the rice is cooked, transfer it to a bowl or large plate and stir to fluff it up. Drizzle the vinegar mixture over the rice and fold it in gently so as not to mash the rice. You can use a fan while your are mixing so that the rice will cool off faster and it will develop a slight sheen to it. When it is cool enough to handle, you can start making your sushi rolls. Here’s a good place to learn how to roll your maki sushi, with step-by-step photos. 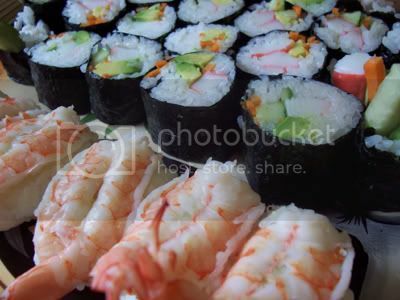 Visit Sushi Day for a daily dose of sushi. Ahhh, more great recipes ideas. Great resource for upcoming holiday cooking. Hello Jmom! Those look so cool! Hello JMom! congrats on your new domain! buzz me when it’s up and running please? I must agree with chateau, you really made it sound so easy! btw, your batch look perfect and I just wanna reach out to my screen and grab them, sheez!